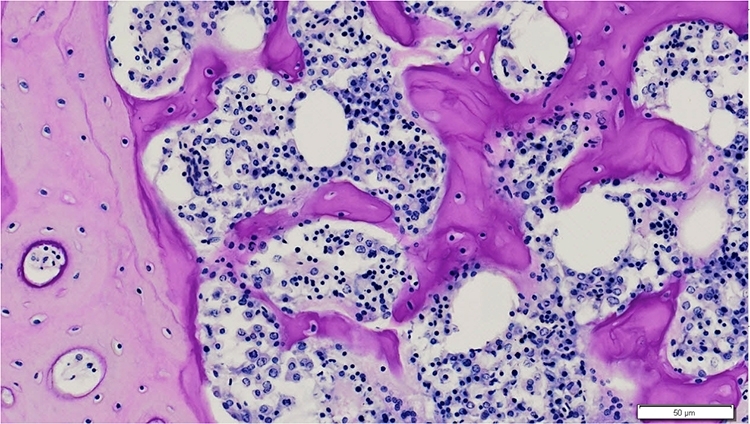 The appearance of medullay bone resamples that of trabecular bone (cancellous bone, spongy bone) but in contrast to trabecular bone which only can be found at the metaphysis and epiphysis at adult age, medullary bone can fill up the entire diaphysis during the egg-laying period. When the egg-laying period is over, medullary bone will disappear almost completely. There are no Haversian canals in medullary bone. Medullary bone contains less collagen fibers and these fibers are lying less organized. The hydroxyapatite crystals too are randomly distributed throughout the matrix. Medullary bone is more heavily calcified and non-collagenous proteins, proteoglycans and carbohydrates are also more abundant. This makes medullary bone highly positive at PAS staining.